Developer James Vaughan will speak on how infecting the planet can help public health awareness. 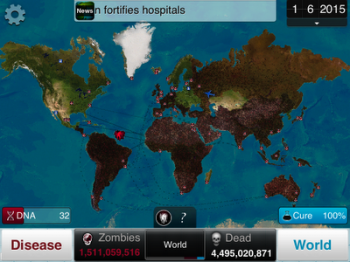 Plague Inc., the outbreak strategy game where you attempt to infect the globe (especially Greenland) with your evolving virus, has enjoyed solid success with its formula of kill-all-humans as effectively as possible. The game has even caught the attention of the Centers for Disease Control and Prevention (CDC), and now the CDC has invited creator James Vaughan to talk about the mechanics behind Plague Inc.
Vaughan will be presenting a number of private lectures this month at CDC headquarters in Atlanta. The discussions include how diseases spread within his game, and the possibility of using games as a means of promoting public health awareness. The developer says that the game isn't meant to be a pure simulation of how an infectious disease is transmitted, but he says: "The overall impact of a disease spreading...is pretty realistic. You have the airports and the boats and it spreads from these major flight connection areas to smaller, more rural areas." "I made Plague Inc. as a hobby", Vaughan adds, explaining that he has no medical background, having studied economics in college. "I tried to make it as scientifically plausible as possible." The former consultant worked as the sole developer on the game as a side project, with the aid of three freelancers. After its release, it reached #1 in paid app rankings in five days, and after seven weeks its download numbers soared to 1.1 million. According to Apple, it was the 15th most downloaded paid iPhone game of 2012 in the US. If you want to try your hand at wiping out the human race one sneeze at a time, Plague Inc. is available on iOS and Android.